Joint Church Aid was formed in response to the increasingly desperate humanitarian situation occurring in Biafra during the war. Various Protestant church organizations had been frustrated with the World Council of Churches’ neutral stance in the war and by its decision to work through the ICRC to deliver aid. JCA was a collaboration of those groups and Caritas International. JCA was built on an earlier group, Nordchurch Aid, a coalition of Northern European churches that been coordinating airlifts of food, medicine and supplies to Biafra for several months. After an expansion of airfield capacity in October 1968, the organizations collectively decided it was time to purchase a larger aircraft in order to increase the shipments of aid to Biafra; this meant the formation of a coordinated group, thus the JCA was born. At this point, then, there became two major relief efforts into Biafra. The ICRC’s effort, which was supported by most governments and groups like the WCC, was done with the permission of Nigeria’s Federal Military Government and launched from Fernando Pó (now Bioko), an island off Equatorial Guinea — although relations between the Nigerian government and the Red Cross were often tense and difficult. In early June 1969, a Red Cross plane was downed and the pilot killed; this effectively ended the ICRC’s airlift. The JCA airlift was launched from the island of São Tomé. Shortly after the JCA begins delivering aid, the JCA-USA is formed, made up of the National Council of Churches, Catholic Relief Services, and the American Jewish Committee. It raises funds to support the airlift. The JCA also lobbied politicians in an effort to put pressure on them to call on the Federal Government of Nigeria to stop disrupting the humanitarian assistance being delivered to Biafra. Over the course of two years, pilots working for the JCA flew a total of 5,314 missions from São Tomé to various parts of Biafra, delivering a total of 60,000 tons of aid supplies. However, during the same time period, 25 JCA pilots were killed. de Montclos, Marc-Antoine Pérouse. “Humanitarian Aid and the Biafra War: Lessons not Learned,” Africa Development 34:1 (2009.):69-82. “Joint Church Aid-U.S.A., Inc., memo to Clarence C. Ferguson, Jr., Coordinator of the Nigeria/Biafra Civilian Relief .” Feb. 28, 1969. Archived at 2001-2009.State.gov. Kadidal, Akhil. 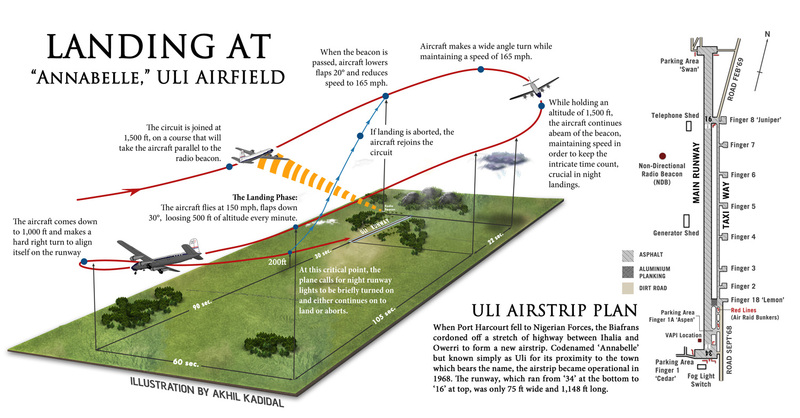 Illustration of the landing process at Uli Airfield. Weapons and Warfare. Meisler, Stanley. “Food Pilots Risk Lives to Keep Biafrans Alive.” Los Angeles Times, Oct. 7, 1969, 12. Omaka, Arua Oko. “Humanitarian Action: The Joint Church Aid and Health Care Intervention in the Nigeria-Biafra War, 1967-1970.” Canadian Journal of History 49:3 (2014):423-447.